Concrete Countertop FAQs: Will they crack, stain, etc? This project was featured in the Spring Parade of Homes in Grand Rapids, MI. It consisted of honed black countertops, and a 2" thick fireplace surround with stainless steel inserts in each end. Get this look using Iron Oxide Black from Prism pigments. Read about how this project was created. 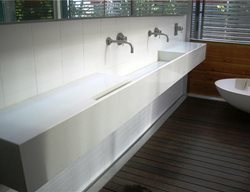 Large, white concrete countertop that was formed in a mold made of plexiglas and plywood. 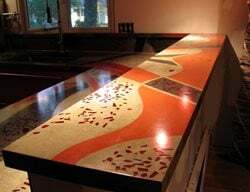 This countertop features a terrazzo finish with an inlaid Brazilian agate and acid-stained borders. Also, 31 pounds of Portland cement were eliminated by replacing 22 percent of the mixture with fly ash, resulting in an Eco-Friendly Leed certifiable functional countertop surface. Meticulously formed and cast color inlays within a concrete countertop. Monolithically poured, no fill. Exposed recycled red glass chunks and chips in a modern pattern designed by J&M and inspired by the client's taste. See more concrete countertop color options. This is a 500 pound island with a 12 inch cantilever, integral single basin and custom drain grooves. Color is ‘deep charcoal’ with 10% fly ash. Black concrete countertops and curved bar with coastal map inlay design. Residential bar countertop with chiseled edge. See more edge profiles. Winner of a 2012 ASCC Decorative Concrete Council Award - First Place Certificate for Countertops. Winner of a 2012 ASCC Decorative Concrete Council Award - Second Place Certificate for Multiple Applications, Over 5000 SF. A cast-in-place concrete bartop is the focal point of this steakhouse bar. The final outcome is a continuous rectangular bar that is 33’ long by 10’ wide. On the outside, it has a custom 2 ½” half round bull nose that extends the full 86’ perimeter. The inside edge has 24’ of custom fabricated 1” x 4” stainless drink rails embedded into the concrete. Forming this countertop took two days. The concrete was placed and finished with a hard trowel. After curing the surface was stained with various colors and techniques to give it the final finish. The sealer is epoxy with a urethane topcoat. This meandering bartop is 65 feet long and incorporates beer bottles and taps. Get this look using PreiTech foam forming system, enCOUNTER fiber-reinforced concrete countertop mix, DCI's solvent-based dyes in sunrise yellow, sunbaked orange, mahogany, onyx and Caribbean blue, DCI’s metallic pigments, Kemiko’s SS 12021 epoxy, Flattoo stencil from Surface Gel Tek. This island countertop was cast in one piece for a seamless look. These 16 foot long seamless counters were cast in place. Get this look using EnCounter bagged concrete mix, white microtopping, solvent-based dye, copper metallic epoxy, clear epoxy, and a polyaspartic. A logo was created on this bartop using a sandblast stencil and airbrush-applied dye. Get this look using twilight gray concrete pigment, from Blue Concrete, Rocktop UV sealer, from Surface 519, sandblast stencil from Razor's Edge Graphics, and concrete dye from Bomanite. The homeowner brought in a piece of backsplash and wanted to use concrete that complemented it. She saw Concrete Interiors’ VISION recycled glass countertops and fell in love with them. After she found out that the concrete tops could be customized, she asked if some of the 1/2" square backsplash glass pieces could be incorporated into the top. They could, so she ended up picking a Pine colored traditional steel trowel finish for the perimeter of her kitchen. Using the same color recipe but decreasing its intensity, Concrete Interiors was able to tint the base of the VISION glass countertop while incorporating pieces of her splash for the peninsula piece. The perimeter and the peninsula were married up at a seam and the homeowner was ecstatic with the look of her new kitchen (and the tops). Concrete bartop located at a restaurant in La Jolla, CA. Natural gray color with satin finish. In a home in the Rocky Mountains, the client asked for a countertop that would remind him of the majestic landscape. For the master bedroom counter, West Coast Concrete Design created a very natural and organic-looking countertop and backsplash. Built in a triangle-shaped form, the concrete backsplash was poured in steps to create variation in the layers. The top edge was left exposed and then various tools were used to create the rugged edge of the backsplash. 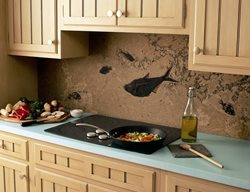 On the face of the backsplash, minimal grinding was done to the top and bottom portions, and more grinding was done in the middle to create the rough look. The project measured 76” long x 1’ high. The side piece was 22” long. Both the countertop and backsplash were colored with pigments that were added to the concrete mix. These countertops were cast-in-place. They are 1 ½” thick with block lock for reinforcement. The color is QC boulder grey with Nature’s Palette black on top, then sanded. The countertops are a roman slate texture after being hard troweled. They were also sanded numerous times before the final colorant. The edges are formed to look like broken stone. The sink/island has a 2-foot overhang. With a striking 6-inch drop edge design feature, this concrete island added drama to a contemporary kitchen. The warm, earthy taupe shade complemented the black cabinetry and stainless steel appliances and fixtures. The island was cast as a single piece providing a seamless surface that created challenges transporting and installing. Learn more about how this countertop was designed, and how Trueform Concrete is dedicated to making eco-friendly products that use sustainable materials and fabrication processes. Purple, concrete bar top with thick pieces of glass embedded and lit with LED lights. This custom designed residential concrete countertop features an integral drain board, inlaid copper, and a large over hanging breakfast bar supported by a stainless steel leg. The countertops were precast in 5 pieces and integrally colored using Cheng’s stone. This concrete bar was custom designed for the Coldwater Cafe in Tipp City, Ohio. The bar top was precast in five pieces and the step at the base of the bar was precast in three pieces. The concrete was integrally colored in a custom light green color. This traditional and very functional kitchen features 2 inch thick brick red concrete countertops. An integral drain board was cast into the countertop. The backsplash and window sill are also cast concrete in the same brick red color. Bar and countertop built with Glass Fiber Reinforced Concrete (GFRC). 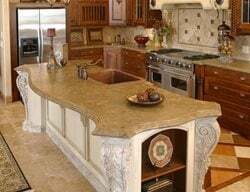 Read more about GFRC countertops. Close-up of concrete bar top that was custom designed for the Coldwater Cafe in Tipp City, Ohio. The concrete was integrally colored in a custom light green color. Featured as Picture of the Week on 10/30/08. This residential French country concrete countertops was precast and hand troweled in our khaki color with light brown glaze. Two iron scrolls were inlayed and hand troweled into the concrete. The classic edge profile and sink edges were distressed to follow suit with the cabinetry and gave this countertop an old world look and feel. This double level concrete reception desk was created for Pilates on the Lake in Pewaukee, WI. The main countertop was created by folding together different shades of tan to brown to give it a fiery feel. To create the look of the upper island, thin circles of various sizes were poured of orange concrete. They were then attached to the form and the gray concrete was poured over them. The top and sides were then ground to expose the aggregate. The backsplash was created using plexiglas to curve the edges and it too was ground to expose the aggregate. The concrete countertops in this kitchen were hand troweled. The island in this kitchen created the perfect opportunity to inlay a unique design element, an integral towel bar. We chose brushed steel for this inlay which was cast into the form. This charcoal colored concrete countertop features three copper inlays that serve as a trivet or hot plate. 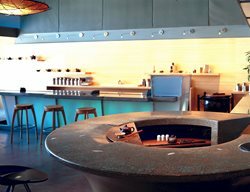 This T-shaped island bar top is made of precast concrete. It was cast in two pieces, the color is Twilight gray. It is clear that this homeowner isn’t afraid of color. They chose a Rosemary colored top and backsplash to accent the "contractor blue tape" cabinets. This house also included a fireplace surround with floating hearth done in shades of grey. The tops have Concrete Interiors' signature steel trowel finish. This precast concrete countertop with an undermount farm sink was colored with integral colorant and diamond polished. This concrete countertop and integrated farm sink feature embedded stainless steel inserts that create a drainboard and trivet. Precast, hand troweled, countertop that was wet cured for several days, which increases strength and virtually eliminates cracking. An illuminated concrete countertop featuring fiber optic lighting. The Concrete Countertop Institute has been offering classes for incorporating fiber optics into counters since 2006. Kitchen island with a serpentine French edge. Also features carved corbels and an inlayed copper sink. This geometric countertop was colored and then polished with a handheld grinder/polisher. 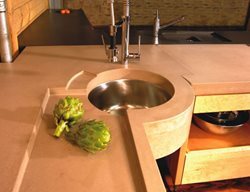 Concrete countertop incorporates an integral chop block butted up against an undermount stainless steel sink. 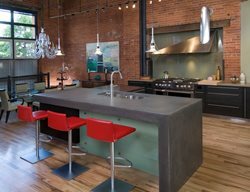 Read about how this concrete kitchen island was created. This countertop is made to look 3-D, appearing to be one thick piece of concrete. Also, it was designed to double as a place to serve food to guests and a seating area. A double sink made to look like a thick block of concrete floating in the air. It hangs from a reinforced steel wall with 2" spaces on either side to increase the effect. Read about how this floating sink was created. Circular kitchen includes an island that is half concrete and half butcher block. Cast in natural gray, the concrete was then ground to expose the aggregate, which had been seeded with mother of pearl. Read more about how this concrete kitchen was created. An oversized concrete kitchen island adds functional beauty to a modern kitchen. Colored using Davis Colors pigments, this kitchen countertop includes odd angles, an integral drain board, and many more unique features that make it a stunning centerpiece in the home. 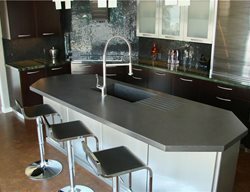 Read about how this concrete island and kitchen countertop were created. Cookout and integral sink cast as one piece in an integrally colored concrete countertop kitchen island. Precast integrally colored countertops. Upper bar measures 11-foot by 6-inches long. Precast concrete countertops, including a farmhouse kitchen sink, weighing 260 lbs., poured as one single piece. This 18' long jet black island resembles a concrete surfboard. Lexan, the material used to make nalgene bottles, was used in this countertop for added, bendable strength. Read more about how this concrete island was created. A heavy stone seamless texture stamp was used to imprint the stone pattern into light wheat integrally-colored concrete, highlighted with light brown color hardener and a brown powder-release agent, before it was sealed with solvent-based acrylic sealer with a non-slip additive. Read about how this bartop was created. This homeowner has custom built cabinetry on a radius. 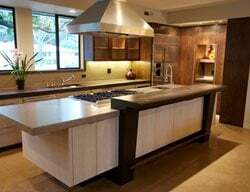 The avocado countertops are made to fit the radius both on the perimeter of the kitchen, as well as the island tops. This kitchen also has an added feature of a “faux” farm sink. They used an undermount stainless steel sink and placed a steel trowel concrete panel in the cabinetry to simulate the look of a farm sink. Stone was positioned in the formwork prior to casting with integrally colored concrete. It was then ground and polished to get the river bed look. Different sponges and rollers were used to create different effects. 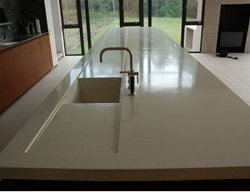 Read about how this countertop was created. Island base is only 2 or 3 inches thick. For the interior form, workers used Styrofoam that was also supported by wooden cribbing. The concrete mix Karmody was used. The black color was integrally mixed into the concrete and concrete was placed in 4 discrete pours, although placement was never stopped so that the entire base is a monopour. Reinforcement, positioned as the concrete was being placed, was wire mesh and fiberglass. See more concrete countertop color options. Inlays are the focal point of this residential kitchen countertop. It was precast in charcoal grey and inlaid with 3 sand blasted glass panels, which were backlit for a luminous defused glow in the surface of the countertop. Island top, credenza, wet bar and wall caps are all steel colored concrete with insert of olive colored on the far end of the island top. Tops have Concrete Interiors' signature steel trowel finish. This kitchen is located in the Napa Valley wine country in a guest house. The homeowner chose a Dark Grey countertop for the perimeter, eat-in bar top and window sill. It features a double stainless steel sink with drain board that includes square stainless steel rods in the drain board. Also done in this house were a Rumsford fireplace surround and three bathroom vanity tops. All are done using a steel-trowel finish. This kitchen shows the versatility of concrete. 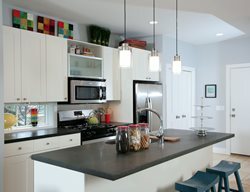 The countertops shown in Dove Gray, are steel troweled. The eat-in bar is held up with two hand-packed cones as supports for the structure. In this case, we chose to leave the voids in the hand-packed cones unfilled. The full backsplash also has a unique feature that frames imported tiles that the homeowner brought back from Italy. This poured in place top concrete countertop was created using a custom countertop mix with dry charcoal pigment integrally added. To enhance the color a water based black dye was rubbed into the surface. It was sealed using a solvent based sealer. This dark suede countertop shows a drain board with stainless steel rod inserts. The countertop is steel troweled.